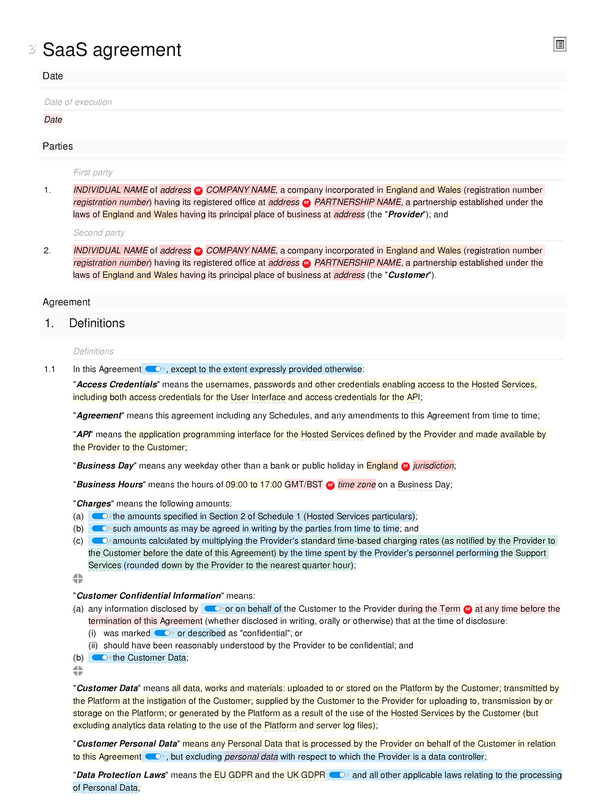 This is a short-form agreement covering the B2B provision of software-as-a-service. 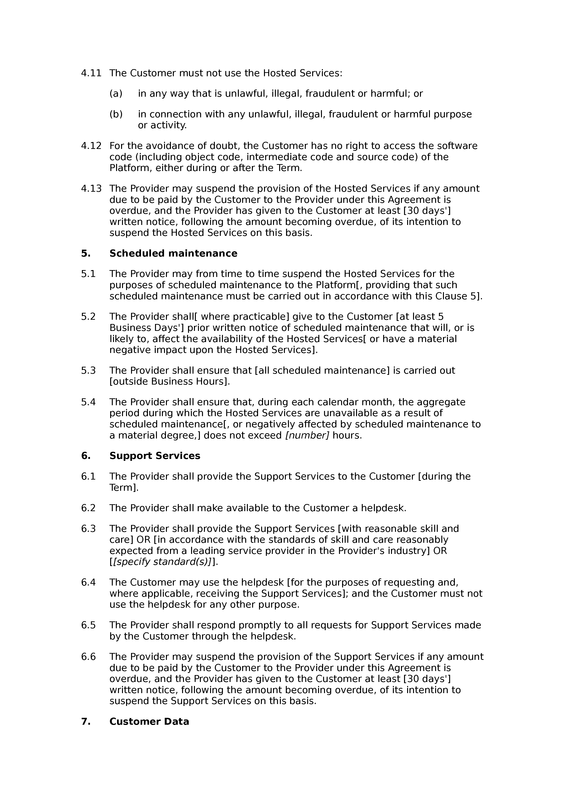 It also includes provisions relating to support and maintenance services. An acceptable use policy is included with this document as a schedule. 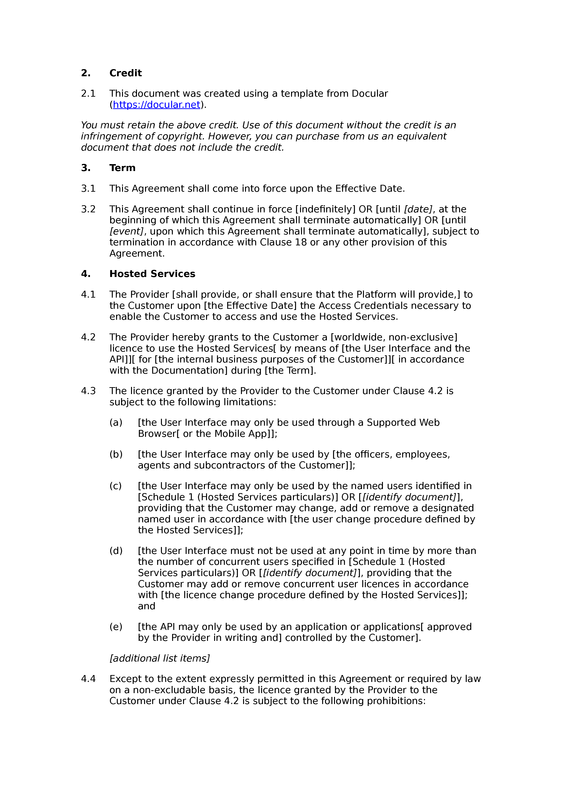 This agreement is not suitable for use where the parties will contract online. 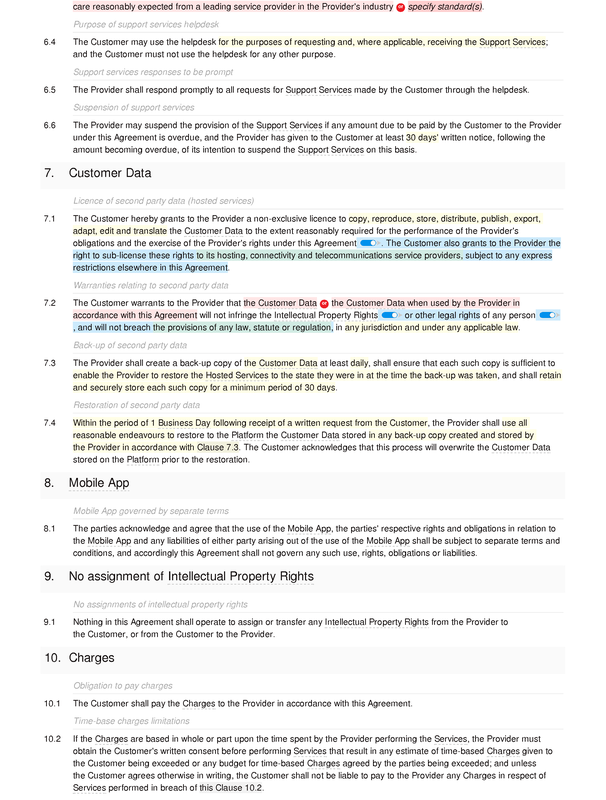 If you are looking for a document to form part of an online checkout process, see our SaaS T&Cs documents. 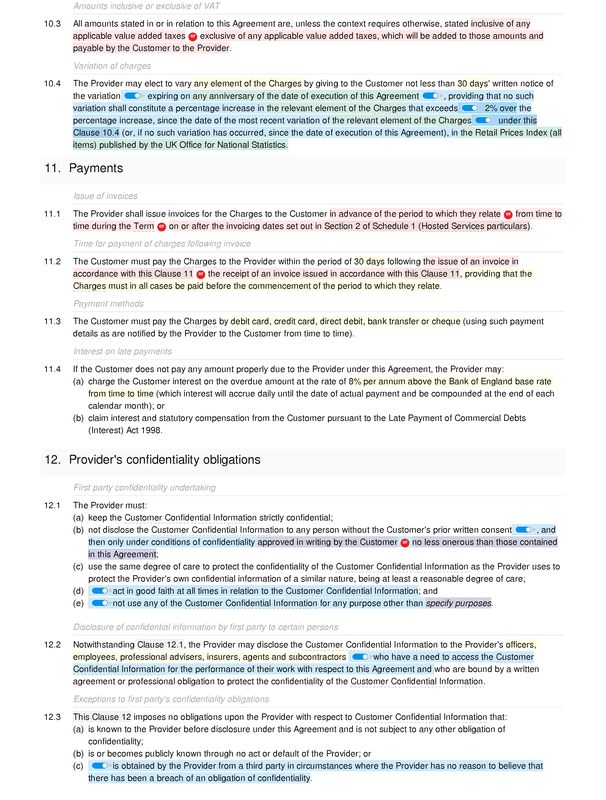 As with our other free documents, this one includes a credit for SEQ Legal. 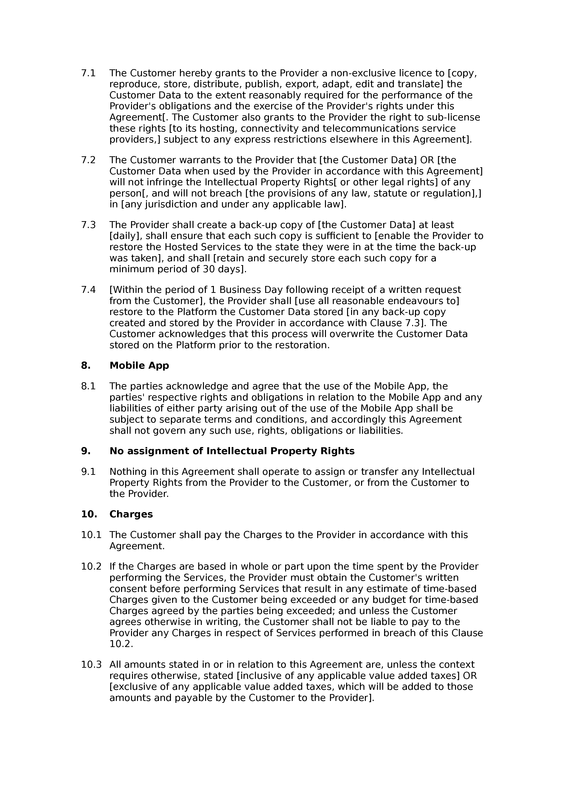 If you would like to use the document without a credit, you should purchase access to our basic SaaS agreement. 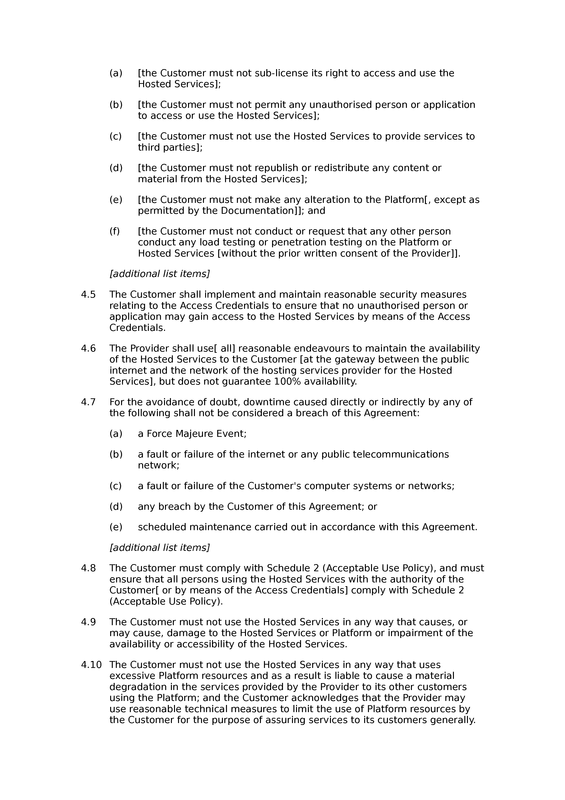 Hosted Services: creation of hosted services account (no set-up or acceptance); grant of licence to use hosted services; limitations on use of hosted services (short-form); prohibitions on the use of the hosted services; prevention of unauthorised access to hosted services; availability of hosted services; FAOD exceptions to hosted services availability; hosted services acceptable use policy; no damaging use of hosted services; no unlawful use of hosted services; no access to platform code; suspension of hosted services. Maintenance Services: maintenance services provision; notice of scheduled maintenance to hosted services; notice of SaaS upgrades; notice of SaaS updates; standard of maintenance services; suspension of maintenance services. Support Services: support services provision; helpdesk obligation; standard of support services; purpose of support services helpdesk; support services responses to be prompt; suspension of support services. 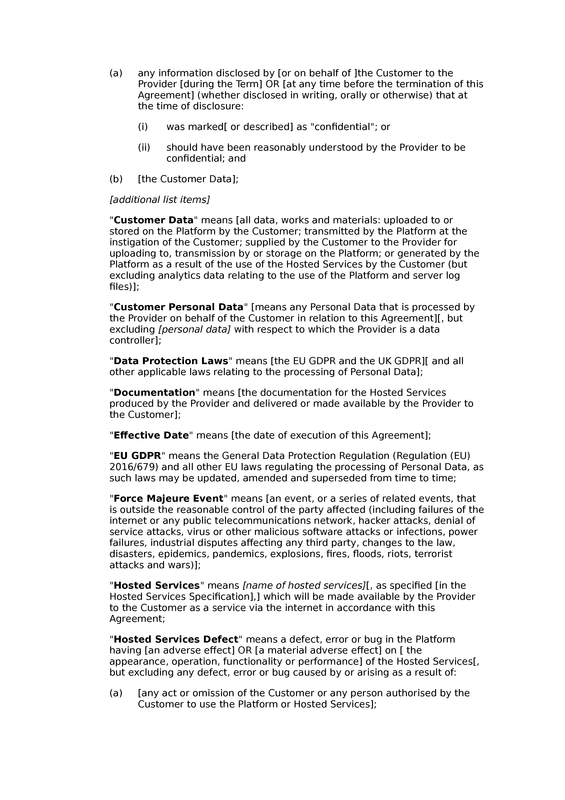 Data: licence of second party data (hosted services); warranties relating to second party data; back-up of second party data; restoration of second party data. 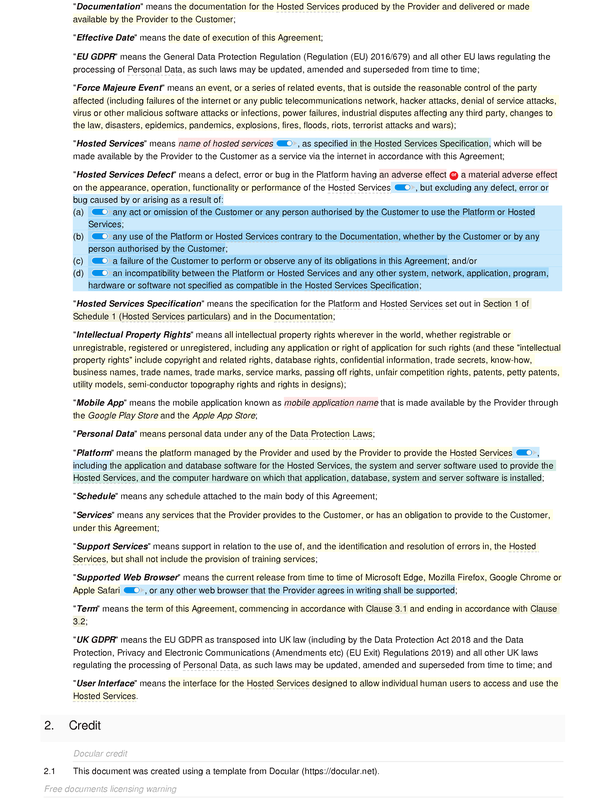 Mobile App: mobile App governed by separate terms. 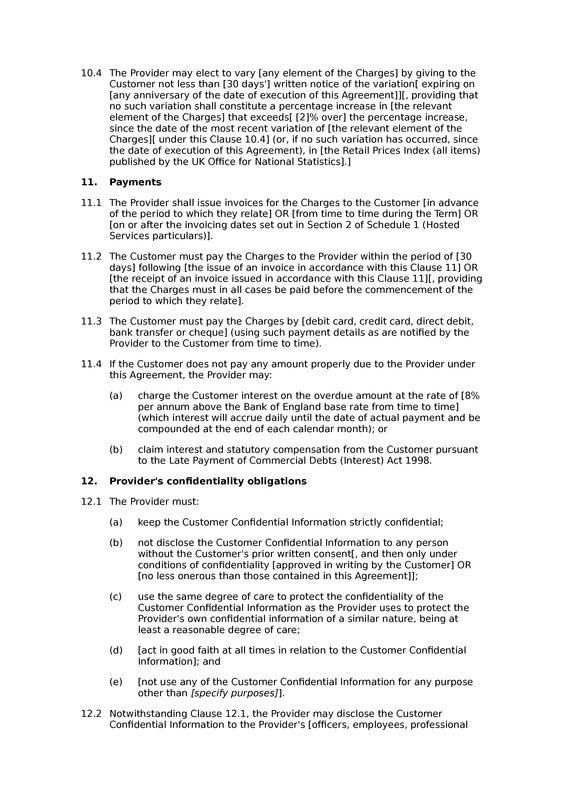 's confidentiality obligations: first party confidentiality undertaking; disclosure of confidential information by first party to certain persons; exceptions to first party's confidentiality obligations; disclosures of second party confidential information mandated by law etc; first party confidentiality obligations after termination. 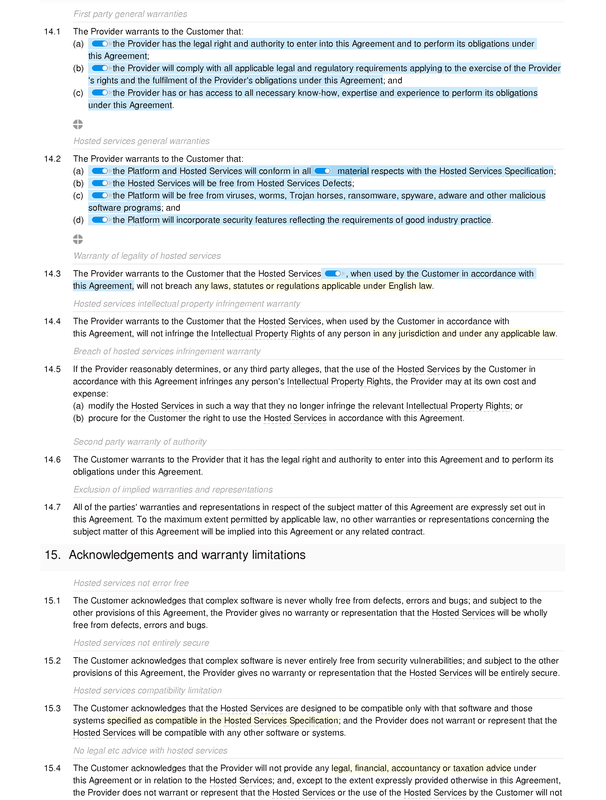 Warranties: first party general warranties; hosted services general warranties; warranty of legality of hosted services; hosted services intellectual property infringement warranty; breach of hosted services infringement warranty; second party warranty of authority; exclusion of implied warranties and representations. 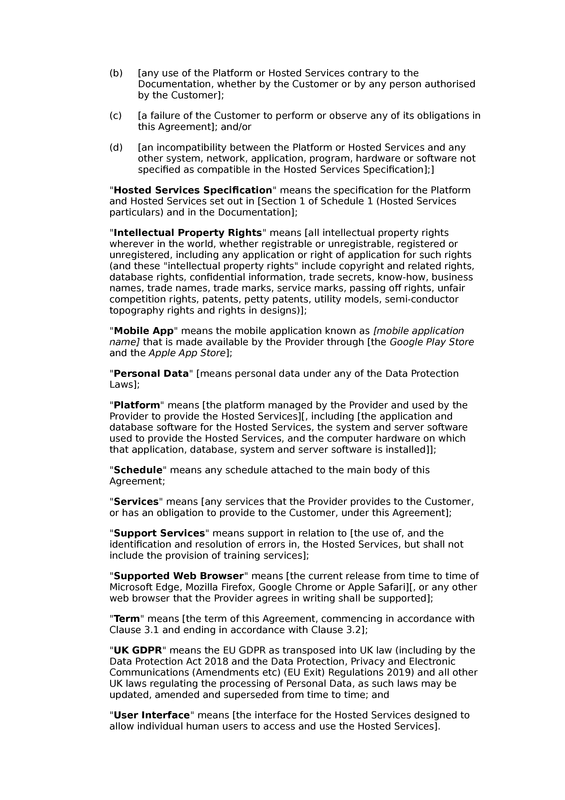 Acknowledgements and warranty limitations: hosted services not error free; hosted services not entirely secure; hosted services compatibility limitation; no legal etc advice with hosted services. 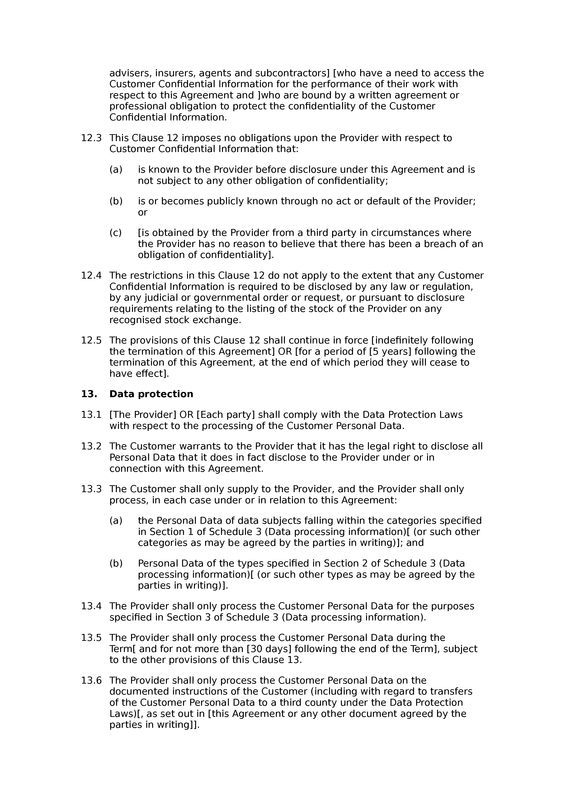 Limitations and exclusions of liability: caveats to limits of liability; interpretation of limits of liability; no liability for force majeure; no liability for loss of profits; no liability for loss of revenue; no liability for loss of use; no liability for loss of opportunities; no liability for loss of data or software (subject to back-up obligations); no liability for consequential loss; per event liability cap upon services contract; aggregate liability cap upon services contract. 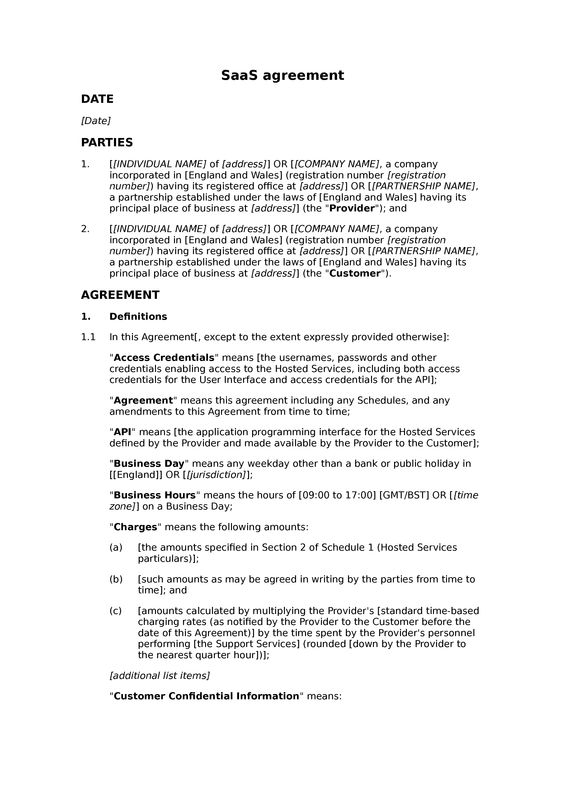 Notices: methods and deemed receipt of contractual notices; first party contact details for contractual notices; substitute contact details for notices. 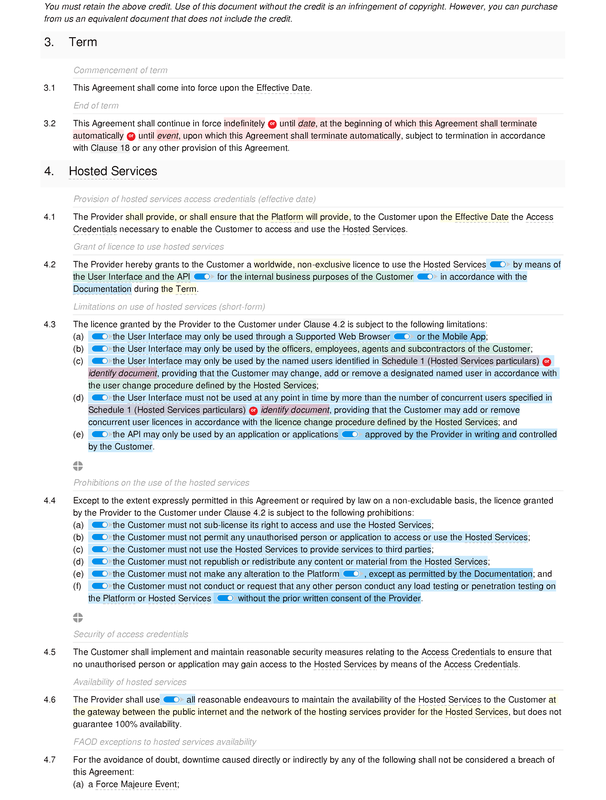 Subcontracting: no subcontracting without consent; subcontracting permitted; first party responsible for subcontracted obligations; subcontracting of hosting. 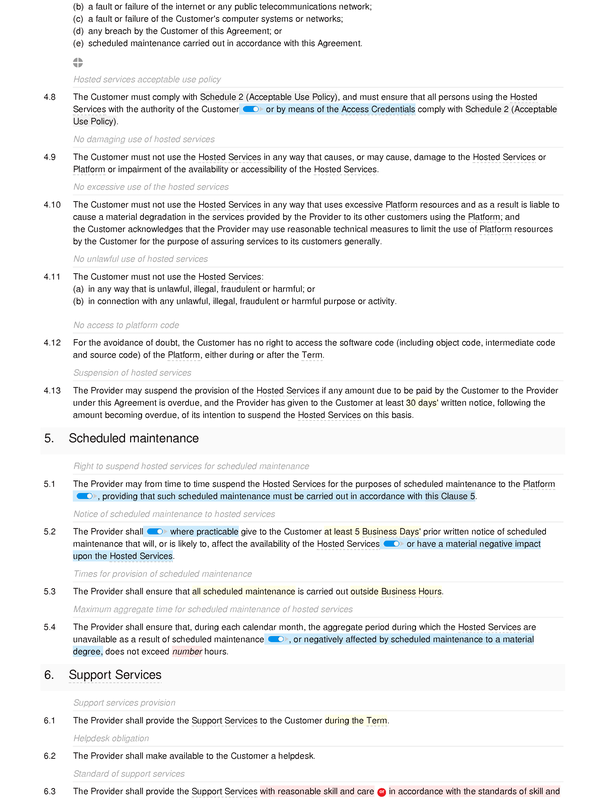 Specification of Hosted Services: specification of hosted services prompt. 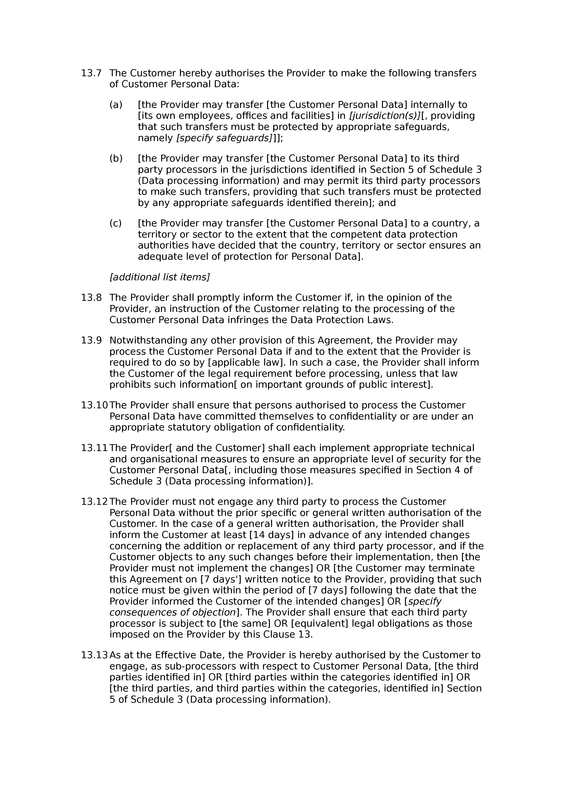 Contractual notices: prompt for second party contractual notice address details. Factual accuracy: content must be truthful; content must not risk defamation. 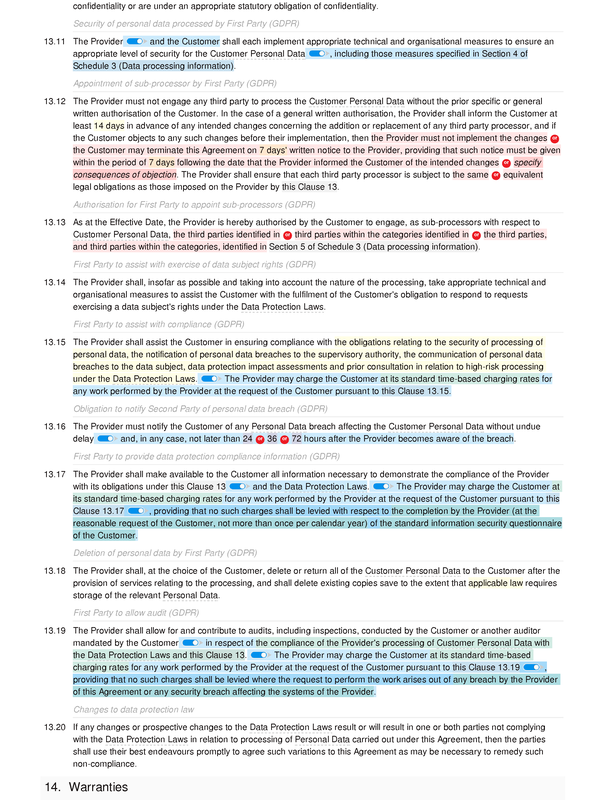 Negligent advice: no professional advice in user content; no negligent advice in user content. Etiquette: content appropriate etc; no offensive content; no annoying content; no hostile communications; no deliberate offense; no content flooding; no duplicate content; categorisation of content; appropriate content titles; courtesy to service users. 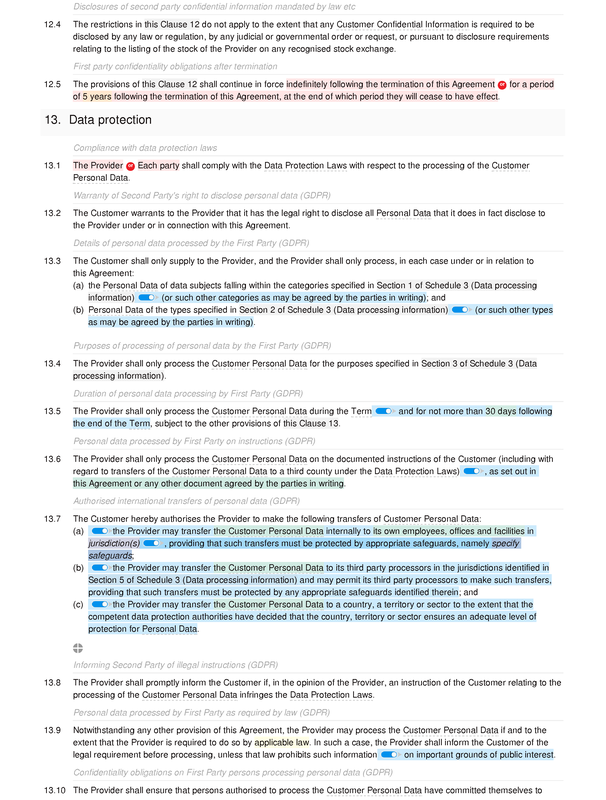 Marketing and spam: prohibition on marketing activities; no spam in user content; sending spam using email addresses; no promotion of marketing schemes; avoidance of IP blacklisting. Regulated businesses: no gambling-related activities; no pharmaceutical activities; no weapon-related activities. Data mining: no data mining. Hyperlinks: no hyperlinks to prohibited content.